In the great variety of tastes and styles, materials and sizes, traditions and trends, we will help you find your closet according to your desires and possibilities. 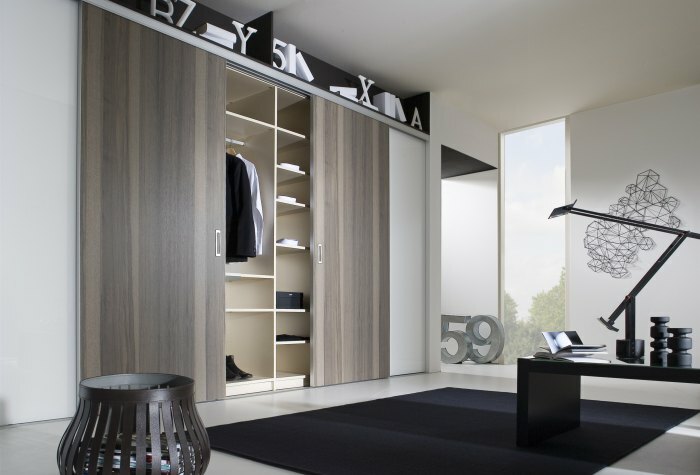 In order to look into the diversity of closets, get acquainted with the process of choosing one. 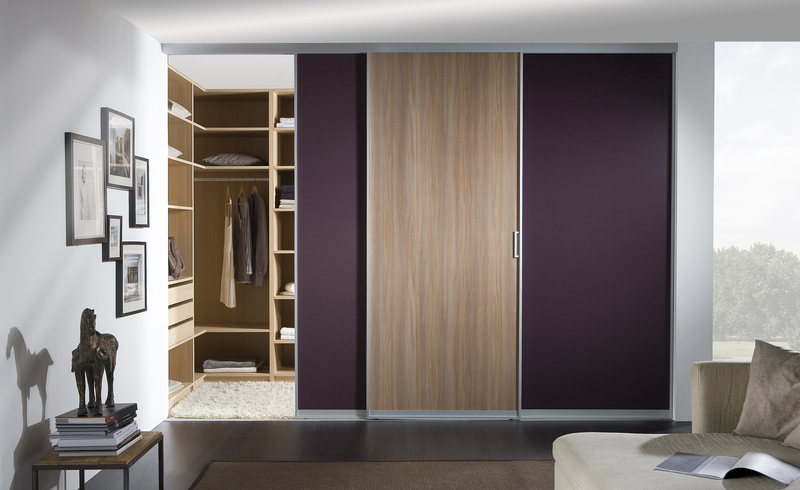 In our opinion, a buyer of a sliding door closet should first consider the frame. 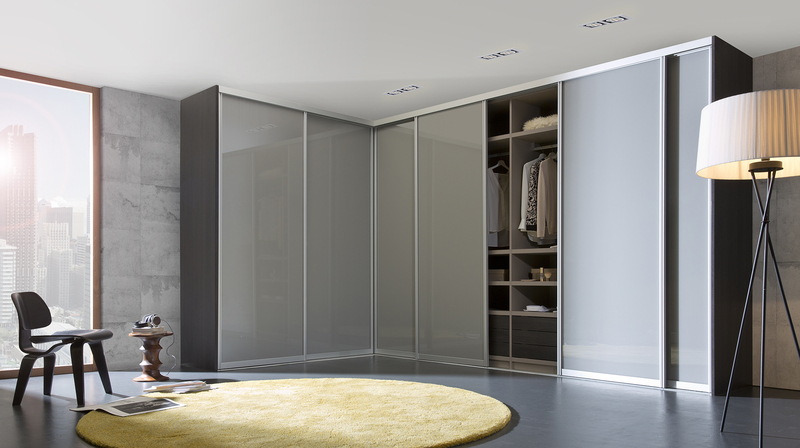 Currently the market is offering sliding door closets with aluminum and steel frames. Steel frames have certain size limitations, but are extremely solid. They are widely used by fitted furniture manufacturers. For example, our company trusts frames of the company Stanley (Great Britain). It guarantees the highest quality. As to aluminum frames, they offer more possibilities compared with steel ones. The construction of a framework like this is lighter. 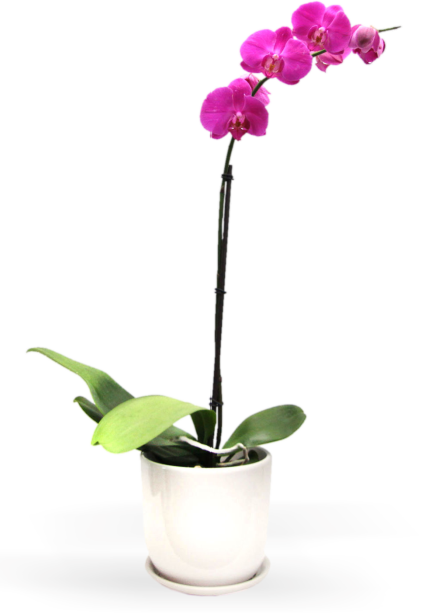 Moreover, they are highly durable. 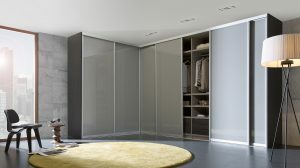 Therefore designers can suggest more solutions to their clients – from fitting a two-sided closet, which replaces a whole wall in the apartment, to installing a non-standard construction in the mansard. In this case it is also advisable to use a well-known manufacturer, like Rival (Norway). This company gives a 10 years guarantee to its frames. However, doors are the most important element of a sliding door closet. And here it is all about durability. This depends on the material of the doors and how resistible it is. Among the most widespread materials are chipboard and medium density fiberboard (MDF). If you are interested in a more prestigious choice, you should consider solid wood. The most popular solid wood types in Latvia remain oak, beech, and walnut, and among soft wood – pine tree and birch tree. One cannot speak about doors without mentioning their decor. Your fantasies can be unlimited. It is classical to decorate doors with mirrors and/or natural wallpaper, as well as veneer sheets. Decoration can be diversified with drawings and patterns, made with sand sprinkles. As we have noticed, today this variant is very much in demand, because it allows drawing an image of any difficulty. Now let’s talk about more modern decor types. Here designers suggest blending various kinds of glasses with other materials – film, textile, and even crocodile leather. However, placing a photo on sliding doors is especially popular today. It comes out very stylish and unique. 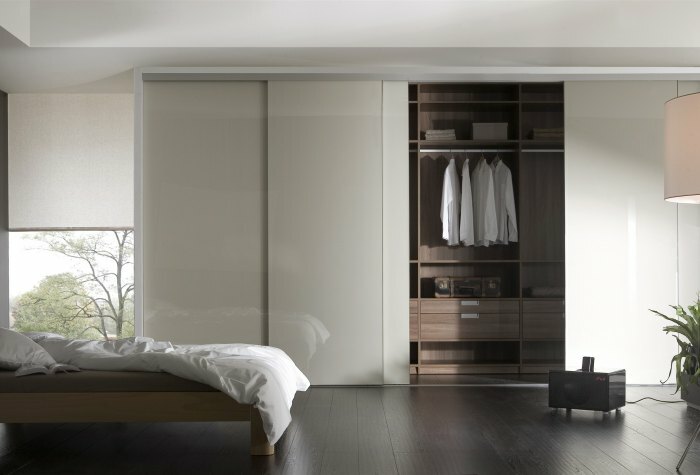 Interior space of a closet is formed, based on three typical frames – cellular shelves and drawers, hangers and stanchions. Here it is worth mentioning that light and hygienic cellular baskets are made of solid aluminum frame with vinyl coating. 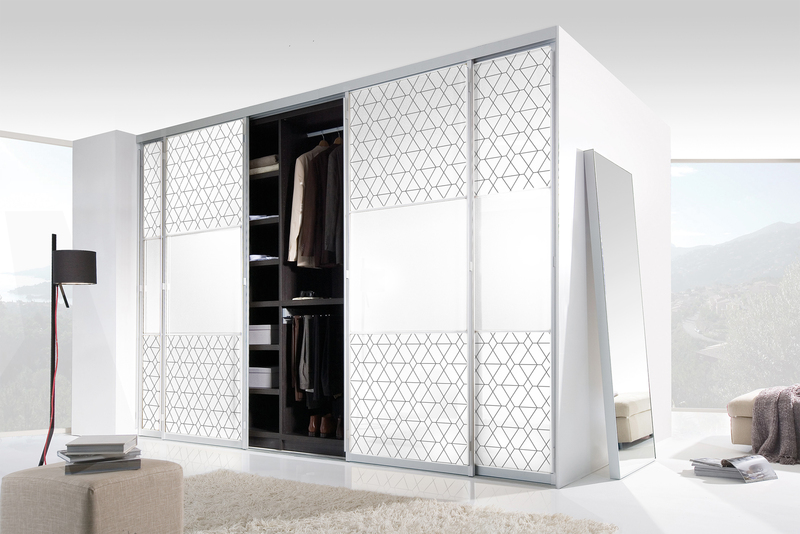 “Cells” create natural air circulation in the wardrobe and make it possible to assess what’s inside. 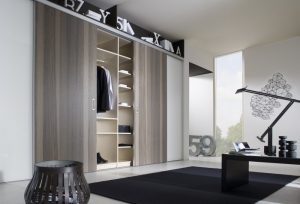 In a well-planned closet all the above mentioned elements will find their place. 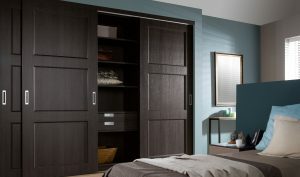 Besides, a closet can be made in a way that a household section will easily fit in – a place for storing your vacuum cleaner, ironing-board, mattress, camp bed and others. If you wish to save some space, we can find a place even for fitted or folding bed, equipped with a lifting device. Since we are talking about automatic devices, it is worth mentioning that for storing dresses, suits and outerwear we can recommend a special lifting clothes hanger. Finally we’d like to point out that a fitted closet will fit in anywhere: in the kitchen, in the hallway, in the living room or children’s room. Even if it seems that there’s no space for a closet, it’s not like that. Many fitted closets fit in even very narrow alcoves. So, do not hesitate! Come to our showrooms and consult with our specialists. They will help you find the right solution, and, as a result, your apartment, house or summer house will get a beautiful new thing – a fitted closet.